David Mitchell hosts the hilarious panel show which turns honest men into lying cheats. In this devious and delightfully funny competition, four comedians have the audacity to lie through their teeth for victory. They compete against each other with lies, untruths and dishonesty. Tall tales, white lies, blatant bluffs and misdirection rule. Can they smuggle the truth past each other or will they be caught in the act of lying? Listen in, play along and try to separate fact from fiction in the ultimate lying game. 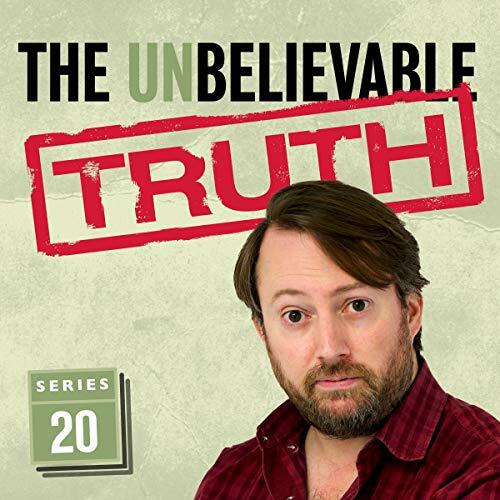 As an Audio Show - free for members - when you add The Unbelievable Truth (Series 20) to your library, you'll get all six episodes, each with a runtime of about 28 minutes. Given that I watch "wilty" it's probably lacking only one thing..... Video! Still entertaining, and great for a laugh. Found this by chance. Really enjoying it. David mitchell is superb as always. I highly recommend. Fantastic short little episodes very much worth the listen especially if you enjoy QI, random facts and or British humor. This is the third series of these that I have listened too and it's great to see that there are so many more available, especially as the ones from Series 14 onwards are free too. They have high-quality panels and luckily for me they have people like Graeme Garden, Jack Dee and Henning Wehn, all of whom I really like, on regularly. It's light-hearted, mostly, though not entirely, family friendly, episodes are easy to dip into and out of between the panellists' lectures and most of all it's bloody funny! A perfect opportunity to kick off your shoes, sit back and be entertained by British comedians. It's Friday night TV for your ears at your finger tips. Ideal for time out, commutes and distraction from high street crowds. It is dependent on the comedic prowess and intellectual power of the invited guest panelists. Fortunately they are all usually on top form as star comedy performers and they do appear to really enjoy the experience and entertainment too. I enjoy listening to them all, and best of all I am in a state of near comedic bliss with the host David Mitchell and his sharp wit and clever observations. Deep joy, gratitude and appreciation from me. although most is not true this is worth a listen as you can leatnt lots of usless dacts , and have a giggle at the same time love this show! David Mitchell excels as quizmaster for this very funny quiz featuring British comedians. The very British orientation both in content and humour had me laughing out loud. couldn't stop laughing at this great guest list & David Mitchell is made for the role of host excellent all round & I think I've learnt something too!